Persistent and balanced taste with intense dark chocolate notes. Medium roast. 16 single-serve coffee pods. Sweet Asian and Central and South-American Arabica coffees with fruity notes yield a smooth coffee for a large cup of long-lasting pleasure. Specially roasted and ground coffees in capsule form, for those who wish to savour the pleasure of an espresso in a large cup. The self-protected vacuum packed capsule preserves the aroma. The blend is selected, roasted and ground to top barista standards. 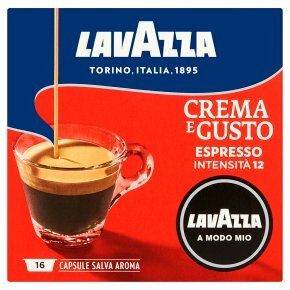 The tamping level of the coffee is equal to that found at the best cafés including up to 7.5g of coffee in each capsule, the ideal amount for a perfect espresso. The slow extraction (25-30") maximises the flavours to bring you the real Italian coffee shop experience at home. Medium roast 100% Arabica.